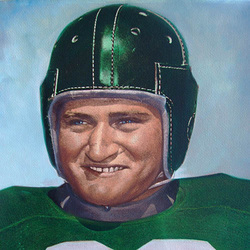 Morris (Chuck) Klein was a versatile lineman for the Hurricanes in 1942-43 and earned the Frank Spain "Most Valuable Player" Cup for the 1943 Eddie Dunn coached Hurricanes football team. Chuck played his high school football in Jamaica, New York and was named All-City, All-Conference and All-Metropolitan during his high school career. He matriculated to Miami in 1942 and like many great ballplayers of his generation, Chuck left school after the 1943 season to serve his country during World War II. While in the United States Navy, Chuck played for the legendary Paul Brown at the Great Lakes Naval Training Station and earned 2nd team All-American service team honors. After two and one half years in the service, Klein was eventually signed by the Cleveland Browns of the All America Football Conference, which was formed by Paul Brown shortly after the war. It was during this period that Chuck aborted his pro contract and returned to the University of Miami to complete his education. Not only was he an outstanding athlete, who was amember of the boxing team, as well, he was an outstanding student. He was named to the Dean's List for scholarship during the 1946 semester. He was a member of the M Club, and Tau Epsilon Fraternity. After graduation, Klein became a successful high school coach in Cocoa Beach, Fl. and a line coach for the Toronto Argonauts of the Canadian Football League. A well known businessman, he founded the Miami Bombers semi-pro football team.